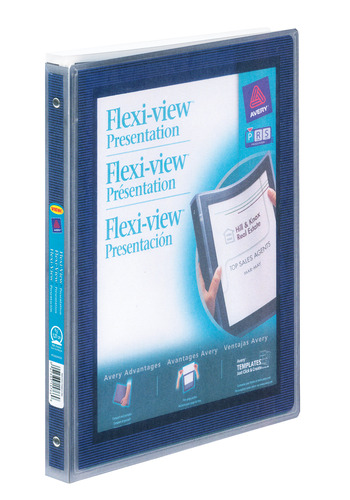 Prepare presentations that are ready to swing into action and are dressed to impress.The Flexi-View™ binder presents your report in flexible, durable plastic that keeps your pages looking neat and presentable. A colourful preprinted border on the front cover frames a translucent window designed to show off your customized title page, and you can personalize the inside front cover too. The durable, lightweight material is easy to carry and won't lift print. Prepare presentations that are ready to swing into action and are dressed to impress. The Flexi-View™ binder presents your report in flexible, durable plastic that keeps your pages looking neat and presentable. A colourful preprinted border on the front cover frames a translucent window designed to show off your customized title page, and you can personalize the inside front cover too. The durable, lightweight material is easy to carry and won't lift print. Predesigned templates and software in our Design and Print Online Software provide easy customization of title pages. The ½" rings hold up to 100 - 8½" x 11" pages to ensure that your presentation stays securely bound and ready to wow.